Maxime and I can barely contain our excitement as today we unleash a major new complimentary component to FeedPress: Podcast hosting (code named: Kraken). This is rather a longer post, but we need to share our story properly and promise it’s worth the wait. After all, we haven’t posted here since September of 2014 (shame on us!). To give you a bit of history, when FeedPress was conceptualized, we set out with the goal of making a solid analytics service for bloggers that you could trust. It’s been 3 years since we launched and we feel proud of how far our product has come. Every time we get an email or mention on Twitter from someone who we have helped provide reliable analytics makes us smile. Last year we expanded a bit and added support for podcast feeds, but we realized that we needed to do more in this area to help you out. Podcasting has positively exploded as not only a form of entertainment and education, but it has supplanted radio for many. For content creators, so many of us have turned to this medium as a means of self expression. From seasoned broadcasters and professionals, to comedians, celebrities, and others with no recording experience, we have all embraced podcasts. We awake in the morning and make that first cup of coffee whilst listening to our favourite show as we head out the door and commute to our workplaces. Some of us casually listen from time to time and others make their living from producing shows that create value and inform, or flat out just make us laugh. Today with the release of audio podcast hosting, this brings FeedPress into a unique position that provides all of the feed analytics and podcast hosting you need within a single dashboard that’s intuitive and attractive. While we were working on this, we took the liberty of making some design improvements in the typography department and our features & pricing page has a fresh layout that more clearly explains why you should use FeedPress. Uploading your first podcast episode is very simple. To begin, go to Settings > Your files in your account. You can choose a file or just drag and drop an mp4 or mp3 file onto the file upload box to start. We did a lot of thinking about this and came up with a plan that we feel gives the average podcaster ample disk space to start out with. 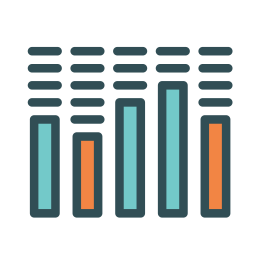 All plans get 250MB of new monthly storage that resets every month, which is equal to about 4 podcast episodes per month. You can upgrade your storage any time and I think you will find that our pricing is extremely competitive. For podcasters who tend to release 2 hour plus extravaganzas, you can upgrade to 1GB of storage for just $20. If you are not yet a FeedPress customer, you can try us out today for 14 days free. Yes, you read that correctly, we now offer a 14 day trial. This has been a long time coming and the barrier to entry has been lifted to make it easy for any of you that want to try FeedPress, but didn’t make the plunge. 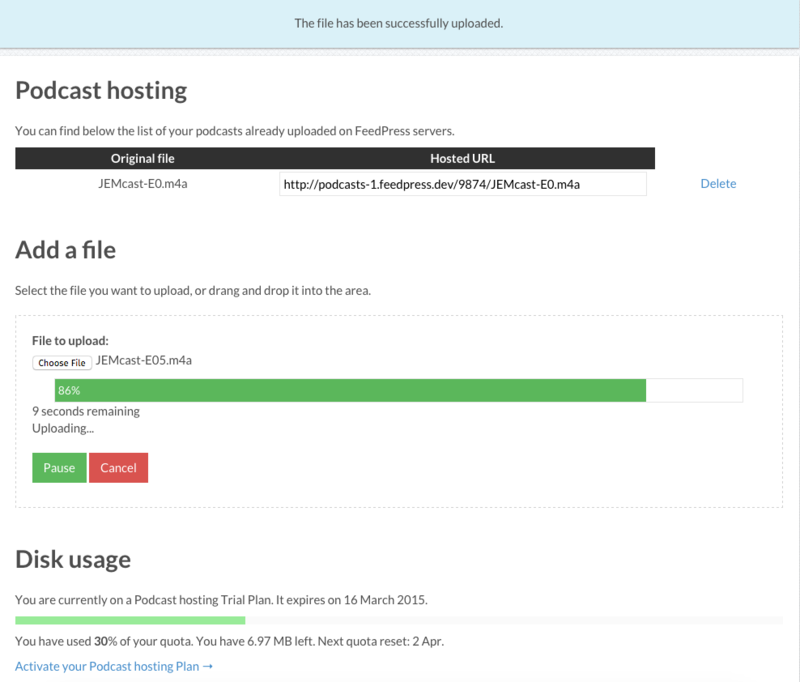 Want to try podcast hosting on your existing podcast feed? Anyone that currently uses FeedPress that has a podcast enabled feed can go to Settings > Your podcast today and enable podcast hosting. We encourage you to try it out, even if you’re hosting with Libsyn or SoundCloud. We think you’ll love it. If you have any feedback, please don’t hesitate to reach out by email, or hit us up on Twitter and Facebook.